Swarthmoor Hall, an English country home in northwest England that served as a haven for persecuted Quakers, is said to be the inspiration for the College’s name. In 1863, the founders felt they needed a name for the proposed institution. They were uncertain about where to build the school, although they knew they wanted a rural setting. One of several possible sites was Westdale, a train station on the Philadelphia and West Chester Railroad named after the artist Benjamin West whose childhood home was nearby. There was no village at Westdale, only farmland. After Swarthmore College was built, the railroad station’s name was changed to Swarthmore, and the village that grew up around the College and the station later took the name of Swarthmore. Why Swarthmore? The name referred to Swarthmoor Hall, an English country house that was a haven for George Fox and other Quakers in times of religious persecution in the 17th century. 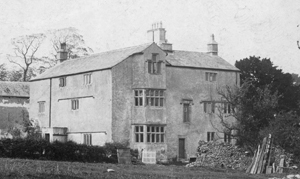 It was the residence of Judge Thomas and Margaret Fell near Ulverston, England, and is still open for visitors. When the College name was first published in the Friends Intelligencer, it was spelled “Swathmore” but the spelling was soon changed to “Swarthmore.” One is tempted to think that this was no misspelling but part of the ongoing debate over whether the first “r” in the name of the College should be pronounced. While 17th-century spelling is hardly consistent, Friends Historical Library has several 17th-century books and pamphlets by George Fox and Margaret Fell that use the “Swarthmore” spelling. Margaret Fell is considered a leader of the first generation of Quakers. She wrote extensively, making the case for women speaking in public. Fell conducted relief and petition campaigns for imprisoned Quakers and even served her own term in prison. No wonder the name was attractive to the founders of Swarthmore College who were planning a school that would educate men and women equally when the notion of permitting women to attend college with men was still considered radical. Before Swarthmore College had a home, there was Swarthmoor Hall. One interpretation of the meaning of Swarthmore harks back to those Quakers who called for liberty of conscience in troubled times, were willing to take the unpopular side, and whose weapons were the pamphlet and the petition, not the sword.